A very warm welcome to this reception. Tonight we are gathered in this magnificent building to celebrate the 65th anniversary of the founding of the People’s Republic of China. Over the 65 years, China has gone through a sea change. In these 65 years, China not only succeeded in providing for the basic needs of its people but also became the world’s second largest economy. China not only ended the scourge of war and poverty, but also found a path suitable to its development. This is the path of socialism with Chinese characteristics. China not only actively integrated itself with the world, but also made outstanding contribution to world peace and prosperity. · China’s foreign trade last year totaled over 4 trillion US dollars, ranking the first in the world. · 100 Chinese companies rank among the Fortune 500. This is a record high. · The IPO of Alibaba, a private company from China sent global investors into a frenzy. The IPO created a new world record. · Every year the Chinese government receives more than 1.6 million patent applications. This makes China the world’s largest applicant of patents. · Every year more than 7 million young Chinese graduate from college. This outnumbers the population of many countries. · China is now the world’s largest investor in clean energy. · By the end of this year, China’s wind power capacity will pass 90 million kilowatts. China has for many years been the world’s largest wind power producer. · Last year alone, China’s solar power capacity increased by over 12 million kilowatts. This was the largest increase in the world and counted for 30% of the world’s total new capacity. · China’s high-speed railway runs over 12 thousand kilometers. That makes up almost half of the world’s total. · China has 29 nuclear power generators under construction with capacity of over 30 million kilowatts. That ranks the first in the world. · With nearly 100 million outbound tourists, China became the world’s largest source of outbound tourists. In 2013 Chinese tourists spent 102 billion US dollars overseas, the highest in the world. · To build a moderately prosperous society by 2020. · And to build China into a modernised socialist country that is rich, strong, democratic and culturally advanced by the middle of this country. · To deepen reform and further open up. · To transform the growth model. · To adjust its economic structure. · To improve social management. · To advance people’s well-being. · And there is a strong stress on sustainable development and protection of the environment. The past 65 years have also witnessed China-UK relations growing from strength to strength. · In 1950 when the People’s Republic was just born, Britain led other Western countries in recognizing the new China. · In 1954 our two countries established diplomatic relations at charge d’affaires level. This year marks its 60th anniversary. · In 1972 the relationship was raised to full ambassadorial level. · And in 1997 China and Britain achieved a smooth handover of Hong Kong. The return of Hong Kong solved a major historical problem in our relations and opened a new era of China-UK relations. As we entered the new century, China-UK relationship has kept pace with the time. Compared with 60 years ago or even 10 years ago, China-UK relationship has never been so deep and so broad as it is today. The achievements of our relations are unprecedented. Our two countries now have annual summit and three pillar mechanisms: the economic and financial dialogue, the high-level people-to-people dialogue and strategic dialogue. China-UK bilateral trade has surged from 320 million US dollars in 1972 to more than 70 billion US dollars in 2013. Britain has become China’s second largest trading partner in EU. In the recent three years, Chinese investments in Britain have totaled 18 billion US dollars. This is more than the combined volume of Chinese investments in Britain in previous 30 years. London has become the largest offshore RMB center outside Asia. The RMB will soon become one of Britain’s reserve currencies. China-UK cooperation in science and technology is deepening. Our two countries have set up a joint innovation fund worth 200 million pounds. This offers strong support for our cooperation in science and technology. China-UK educational exchange and cooperation is growing rapidly. 130 thousand Chinese students are studying across the UK. This makes Britain the largest European host to Chinese students. Worldwide, this figure is only second to the United States. Chinese language teaching has become available all over the UK. There are 25 Confucius institutes and 94 Confucius classrooms across Britain. This means that Britain leads all other European countries in teaching Chinese. Confucius classrooms are also finding their way to the three Crown Dependencies: the Isle of Man, Guernsey and Jersey. China-UK cultural exchange is full swing. The exhibition Ming: 50 Years that Changed China in the British Museum demonstrates an immense interest in Chinese culture across the UK. 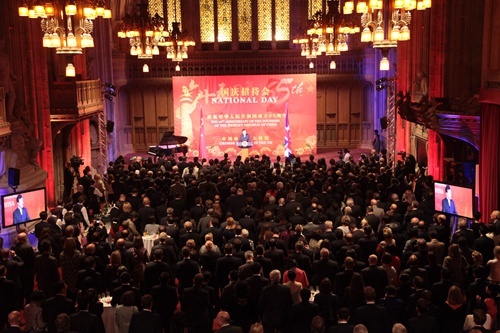 More than one week ago, also here at the Guildhall, the China-UK financial roundtable discussion was held. This was part of the sixth China-UK Economic and Financial Dialogue. The dialogue as a whole created a record of 73 outcomes. I am confident that as our political mutual trust deepens and cross-board cooperation strengthens, we will witness new historic moment of China-UK relations. · First, achieve greater prosperity of China and realize the Chinese dream of the revitalization of the Chinese nation. · Second, I want to see China and the UK become indispensable partners of common growth and inclusive development. I want to see continuous advancement of our cooperation in a wide range of areas bringing greater benefits to our two peoples. I firmly believe that realization of the Chinese dream will offer great opportunities for China-UK cooperation. It will raise China-UK relations to a higher level. And China-UK win-win cooperation will also help China achieve the two centenary goals. Therefore let us work together to make all the dreams come true! 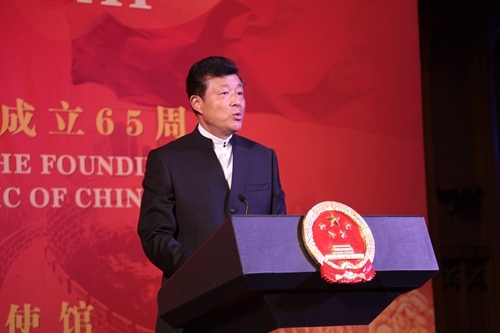 · To the 65th anniversary of the People’s Republic of China! · To the brighter future of China-UK relations! · To the health of all guests present!